Welcome to my Red Couch! So glad you dropped by and so glad the fresh fruit season is finally here. I was craving some blueberries, the first of the season, and came up with making individual cookie tarts. The fruit was fun to cookie craft with and tasted delish! I made the sugar cookie recipe here, via Sue at Munchkin Munchies; they are my favorite sugar cookie recipe. If you are in a pinch, you could use refrigerated dough; but these are super easy to make; they are a no chill, no fuss sugar cookie recipe. Cut cookies out in the desired size. Frost generously with Cream Cheese Frosting; this really is a good frosting; some recipes don't add the whipping cream and the frosting ends up tasting too cheesy. Mix gently the softened cream cheese with whipping cream, powdered sugar, and almond flavoring. Chill frosting for about 1/2 hour. 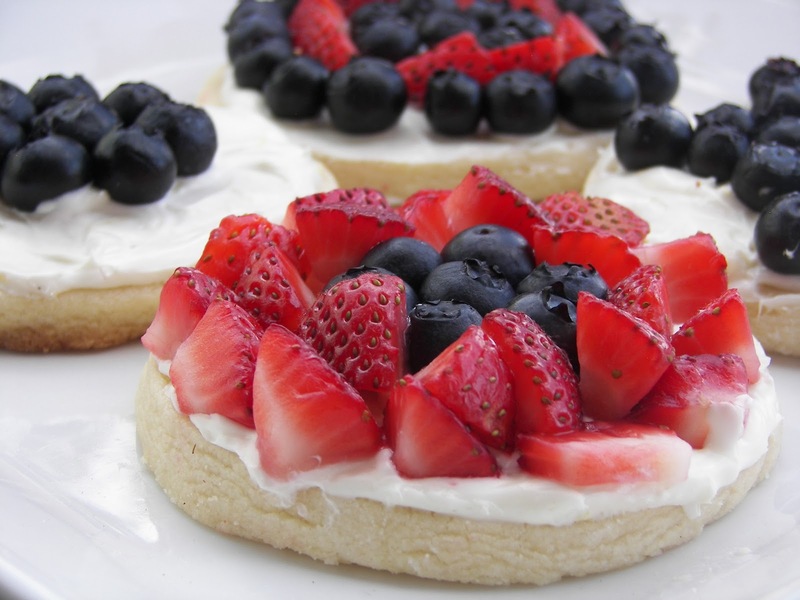 Then frost each cookie generously and decorate with blueberries and strawberries. I think raspberries would taste good also; they still are a bit dear right now in our area. Note: The Cream Cheese Frosting recipe makes quite a bit. If you do end up having more frosting than cookies, save it to dip strawberries in. I really like these cookies. They are like little tartlets but without all the tart making that drives me crazy! And they are sooooo pretty. 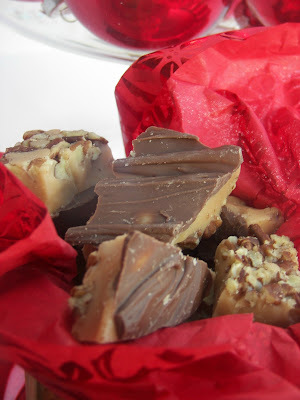 I would love to make these for 4th of July! These look so delicious. I love berries on just about anything. Nothing can beat a sugar cookie. I am going to try this recipe with the frosting. xo. Also, I am your newest follower! What a great idea to use a sugar cookie as the base! Perfect for July 4. The icing recipe sounds really good with that extra bit of whipping cream. They look wonderful! Thanks for the recipe, I am always looking for a better sugar cookie recipe! It got very hot here very quickly! We skipped Spring! These are so pretty, and I'm sure I would love the taste. They remind me in looks of miniature pavlova, only packing more punch in the cookie part. Yum. Great idea to use the cookie for a tart base! They sound delicious and are so pretty. These remind me of our strawberry shortcake cookie, but with the addition of blueberries, I bet they were amazing! We will have to try blueberries too and they are so great for the red white and blue holidays. 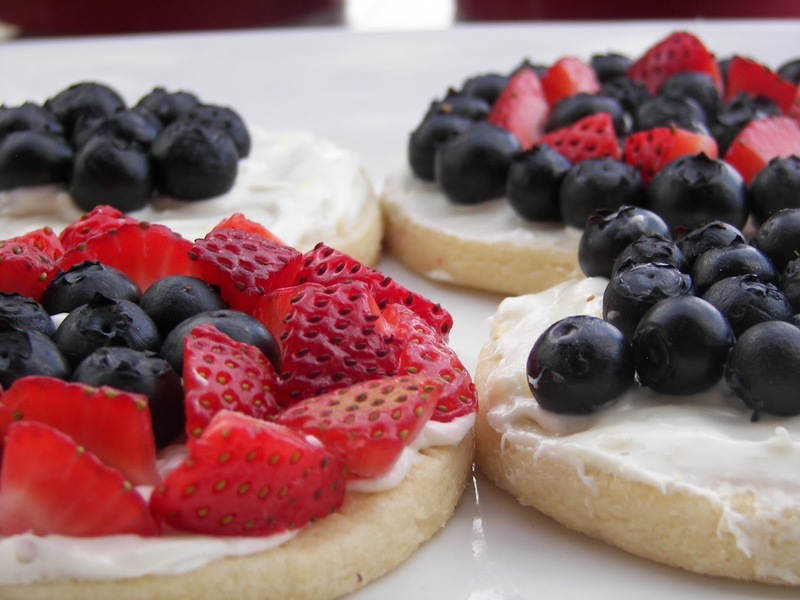 I love sugar cookies and I love berries, great match! 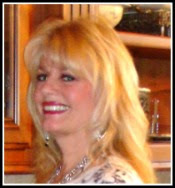 I just found your great blog--I live in Utah too!